TSS PRO 100 prevents saltwater erosion. It weatherproofs, protects, and preserves stone, masonry patios, pool coping/decks, walls, walkways, waterfalls, and other landscaping structures. What is TSS Pro-100 Natural Sealer? TSS Pro-100 Natural is one of our most popular sealers within our TSS Pro Sealer line. The sealant is a deep penetrating, high coverage, solvent-based silicone sealant. The sealant is designed to prevent water erosion and water-based stains, as well as retain the natural look of stone. Not only is the sealant extremely long lasting, but it also cures almost immediately; after being applied, the sealant cures and is ready for use is less than an hour. What’s more, immediate rain following the application of the sealant will have no negative effect; the sealant will still be just as efficient as it would be otherwise. How is TSS Pro-100 Natural Sealer applied? This sealer is easy to apply, and can be done as a do-it-yourself project, or with the help of our professional team at Texas Stone Sealers. The sealer can be applied using a pump sprayer, a brush, or a roller depending upon the surface and on personal preference. If you’re the owner of a home or business and have invested in your outdoor living space, it’s important that you also invest in keeping that space as well-kept as possible. 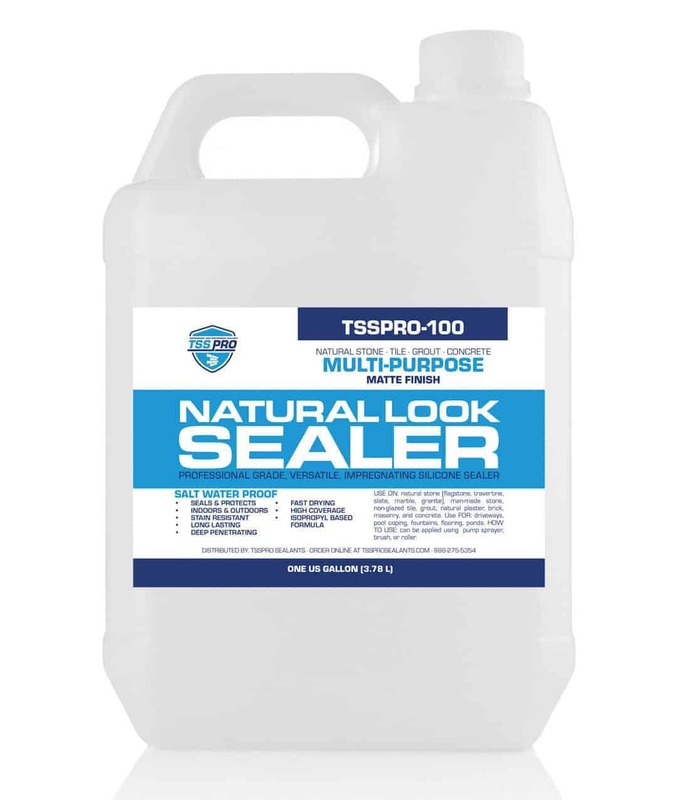 For easy maintenance of outdoor stone, patios, walkways, and ponds, as well as prevention from early decline, you need the TSS Pro-100 Natural Sealer. This sealer is one of the best in its class, is long lasting, and is more affordable that other similar sealers offered by competitors.